Moose skeletons are hard to come by on Isle Royale these days. 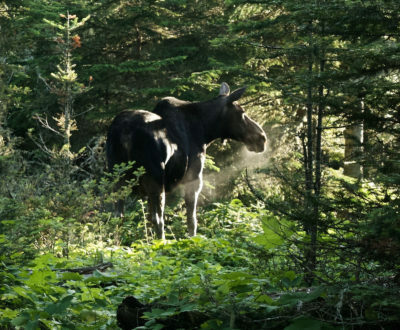 That’s not for lack of moose — the island is teeming with them. For nearly half a century, Rolf Peterson has spent each summer coordinating a small army of volunteers to search for moose remains on the remote island in the northwest corner of Lake Superior, part of Isle Royale National Park in Michigan. 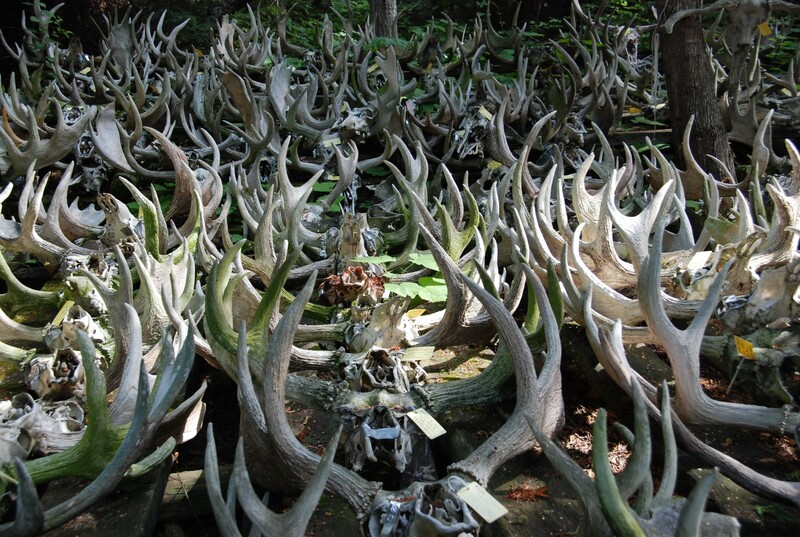 They’ve amassed the largest collection of moose bones in the world, vestiges from thousands of animals stored behind an old fisherman’s cabin where Peterson and his wife, Candy, live for most of the year. “Every dead moose is a puzzle to figure out,” Peterson says. The bones reveal if an animal has been racked by disease or suffered from starvation. Pieced together, the carcasses chronicle seven generations of changes in the moose. Although the moose population has soared, doubling in the last decade, their bodies are elusive to researchers. The sick and elderly among the herd aren’t dying, yet. The problem is the predators that kill the moose and curb the population’s growth are effectively gone. From a peak of 50, now only two wolves remain on the island. Without help, they’ll soon die out. For decades, Peterson has called for the reintroduction of wolves to the park, a genetic rescue to supplement the dwindling population. After years of delay, in June the park service announced their decision to reintroduce 20 to 30 wolves to the island over the next few years, starting as early as September. It’s been a long fight. Researchers have tracked the wolf and moose saga on the island for the last six decades but no one has worked on the study longer than Peterson, now 69. He first heard about the project as a teenager, reading a newspaper article about the research. At the time, the Endangered Species Act didn’t exist, so wolves were not afforded any of today’s protections. You could still be paid by many states to shoot one. But on Isle Royale, a national park since 1940, the wolves were safe. The story stayed with Peterson. In his final year of college, he sent a letter to Durward Allen, the study’s founder and lead researcher, to see if Allen needed a graduate student. The answer back was yes. In 1970, Peterson began working on the project, now thought to be the longest-running survey of a predator-prey system in the world. Not Peterson. He hasn’t missed a research season since he started working on the project as a student and he doesn’t plan on quitting anytime soon. He figures he’s spent more time on Isle Royale than perhaps anyone alive today. “I guess I could call it home,” he says. Peterson knows Isle Royale from the air just as well as he knows it from the ground. He comes back during the coldest stretch of the year to survey the island’s animals from the sky. Then, his research isn’t focused on moose. Winter is the time to find wolves. From the end of January to early March, Peterson shares the island with a handful of people: his research partner, John Vucetich, a population biologist who now heads the wolf-moose project at Michigan Technological University, their two pilots, both named Don, and occasionally another scientist. With deciduous tree leaves gone and tracks visible in the snow, Peterson and Vucetich can get a clear view of the wolves’ activities from a two-seater plane. Before the days of radio collars, finding wolves over the 207 square miles of Isle Royale meant tilting the plane on its side and making tight circular loops, around and around, to comb the ground for tracks. Now, they can digitally track the wolves’ movements. The only hold up in their research is if the weather will permit their small aircraft to take off. For most of the time Peterson has watched over Isle Royale’s wolves, their fate has been uncertain. The inflow of new genes to their population is limited to the slim chance that a wolf from the mainland crosses an ice bridge that forms over the lake in the dead of winter. But as winters warm and development grows along the north shore of Minnesota, the possibility of newcomer wolves grows smaller each year. Direct human intervention hasn’t helped the wolves’ inbreeding problem, either. In the ‘80s, a park visitor brought a sick dog to the island that was infected with canine parvovirus, a lethal infection. Within two years, the wolf population dropped from 50 to 14 individuals, ravaged by disease. The wolves never fully recovered. Meanwhile, the moose on Isle Royale are thriving. More moose means less food in the forest. As the animals graze the island’s balsam fir stands clean, it will take only one harsh winter to starve much of the population and decades for the trees to recover. But the park service has been reluctant to intervene on the island. Throughout Peterson’s tenure, park administrators have come and gone, each with their own idea for how the wolf population should be managed. Many have argued against human meddling in a wilderness area, echoing well-worn battle lines in designated wilderness throughout the country, between active management and a hands-off approach. At one point, park officials considered hunting moose as a means to replace the ecological function of wolves to the dismay of some of Peterson’s colleagues. But Peterson remains unfazed. “Rolf seems to be able to weather them all,” says Oregon State’s Nelson, who has collaborated with Peterson as the project’s self-entitled resident philosopher and has stayed on the island for weeks at a time. “It’s his Norwegian Protestantism,” Nelson says, referencing Peterson’s Midwestern upbringing and Scandinavian roots. It’s not in Peterson’s nature to be verbose. “He is characterized by his actions, not his words,” says Vucetich, his research partner. That attitude shapes his worldview. Before journalism, Lexi made her living by way of chasing mountain goats in the Olympics, playing in tide pools along the coast of Maine, and teaching in a town with more deer than people. When she’s not reporting, she loves getting outside: biking, swimming, exploring the woods, you name it.